**Our Ultimate Outsider stamp can be found at the orientation kiosk in the main parking lot near the restrooms. There is an additional stamp in the visitor center at the front desk. A granitic gneiss outcropping atop the dramatic Blue Ridge Escarpment gives Caesars Head State Park its name. Every fall, from the easily-accessible overlook atop the rocky peak of the Blue Ridge Escarpment, sight-seers are treated to the Hawk Watch program and a spectacular view that extends into North Carolina and Georgia. Caesars Head connects to Jones Gap State Park in what is known as the Mountain Bridge Wilderness Area, an 13,000-acre area of pristine southern mountain forest. Hikers can take a number of loop and traverse hiking trails that connect the parks, and trailside camping is available for those who choose the longer routes. One of the most popular trails at Caesars Head is the four-mile, round trip Raven Cliff Falls trail. This hiking trail leads to the scenic overlook, where you can view the 420-foot Raven Cliff Falls. There is also a 6.6 mile round trip hike to a suspension bridge that crosses the creek above Raven Cliff Falls. The bridge offers a unique view of the falls as they plunge deep into the mountain cove below. 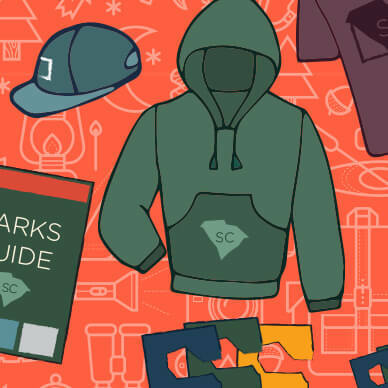 Check out other South Carolina State Parks! Explore another mountainous area at Paris Mountain State Park or observe nature at a blistering pace on South Carolina mountain bike trails.